What is All Teeth On Four Implants? 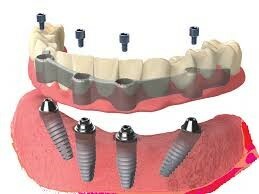 The term All On 4 refers to “all” teeth in one jaw being supported “on four” dental implants. This is a surgical and prosthodontic procedure for total rehabilitation of the edentulous patients or for patients with badly broken down teeth, decayed teeth or compromised teeth due to gum disease. It consists of the rehabilitation of either edentulous or dentate maxilla and/or mandible with fixed prosthesis by placing minimum of four implants in the area of jaw where bone density is higher. The four implants support a fixed prosthesis with 12 to 14 teeth and can be placed immediately, typically within 24-48 hours of surgery. However, immediate loading requires criteria which may not be possible in every patient. The dentist will make the final decision for immediately loading the implants after placing the implants. The technique of All on four implants evolved when in an attempt to avoid certain anatomical limitations typically seen in the back of the upper and lower jaws have, clinicians successfully avoided bone-deficient areas with the use of angulated implants. Dental implants are traditionally placed in the vertical position but anatomical limitations are more prevalent in patients with full dentures, and once the back implants are placed at an angle there is often only enough room left for two more implants in the front. This has led to the use of only four fixtures to support a full set of teeth which can reduce the cost to the patient. Although, All on 4 treatment can help many edentulous patients but is not the only option for many patients with existing remaining teeth. A thorough assessment of the clinical and radiographic information will be performed prior to recommending a treatment plan. 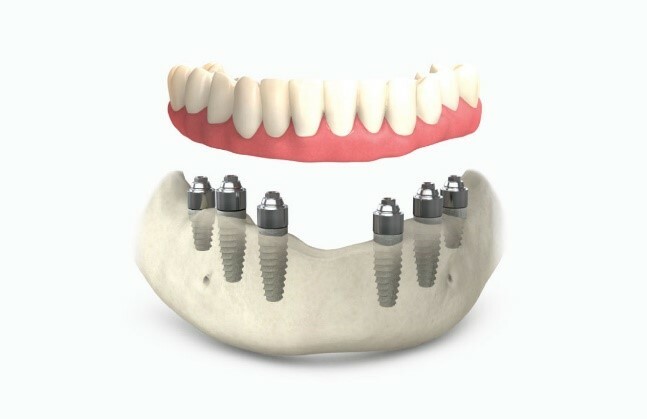 The fixed bridge which fits over the implants comes in few different forms. The prosthetic options provide different strength and long term durability. 1. Metal Reinforced Hybrid Acrylic Bridge. 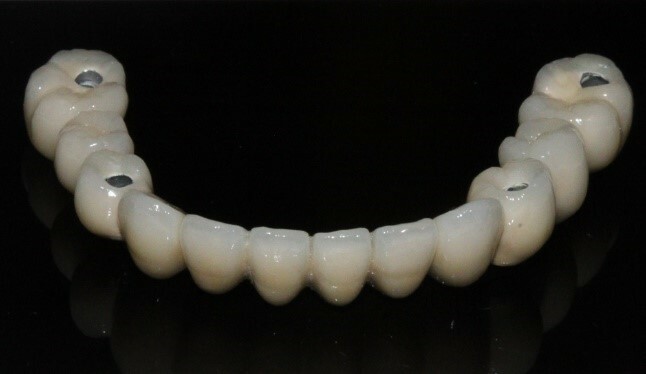 This is a basic acrylic bridge which is usually fitted on the implants within 24-48 hours after placing the implants. 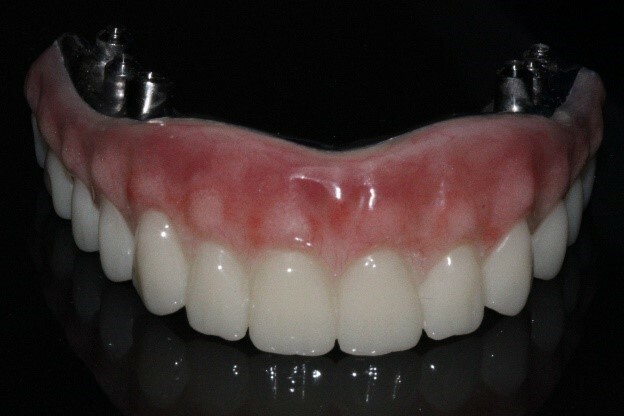 If the implants can’t be loaded, a provisional denture may be made. This option is included in the cost of $15500. However, it may need a reline to fit better with the underlying tissues after the healing phase. 2. Titanium Reinforced Hybrid Bridge. 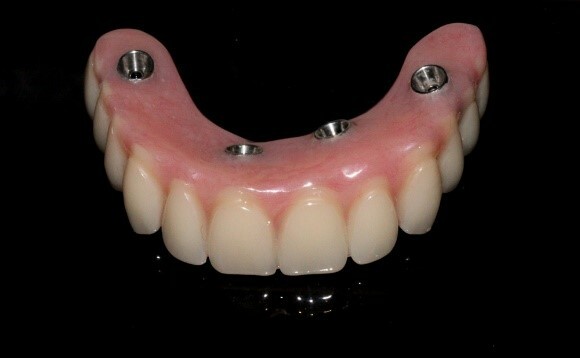 This prosthesis is a very precise and strong fixed bridge which provides a high aesthetic and hygienic outcomes. The strength of these bridges are very high. However, they are more expensive and also more difficult to repair. This bridgework can be offered where there is no or minimum need for replacing gum tissues. They are much easier to clean and maintain. The costs may vary for each individual case. An individual treatment plan will be offered after a thorough clinical and radiographic examination of each patient when they are committed to the treatment. Call us to make a free consultation booking with our friendly staff.